Final preparations are being made in Baghdad for the execution of the former Iraqi President Saddam Hussein, which reports say could be imminent. A US judge rejected a last-minute appeal to block the execution, as unnamed Iraqi officials said he could hang early on Saturday. Iraqi leaders met US military officers to determine the final arrangements. US troops and Iraqi security forces have been placed on high alert in anticipation of unrest. Earlier, the US denied reports that Saddam Hussein had already been transferred to Iraqi custody. His final appeal was rejected on Tuesday. No official details have been made public about when the death sentence will be carried out. However, reports say witnesses have gathered in Baghdad's Green Zone to be taken to an unspecified place of execution, where a gallows has been erected. A curfew has been declared in the former leader's home town of Tikrit. The US State Department urged all its embassies to increase security. Iraq's Prime Minister, Nouri al-Maliki, has said he wants the execution to take place before the end of the year. Several reports quoted senior Iraqi officials as saying the execution would take place at 0600 local time (0300 GMT) on Saturday. That would be before the start of the Islamic holiday of Eid, which begins at noon on Saturday (0900 GMT) and continues into next week. Under Iraqi law Saddam Hussein could be hanged at any time over the next four weeks. However, the judge assigned to witness his death said it would happen on Friday or Saturday. The BBC's Adam Brookes, in Washington says the Bush administration is keen to portray the process leading up to the execution as a matter purely for the Iraqi government and its court system. Earlier on Friday, Saddam Hussein's lawyers said they were notified that he had been transferred to Iraqi custody, an assertion then denied by the US. "There has been no change in his status," US State Department spokesman Tom Casey said late on Friday. It is thought he will remain in US custody until the execution is carried out. When he is taken to the gallows Saddam Hussein will be nominally transferred to Iraqi custody, but the US will continue guarding him to maintain maximum security. US forces in Iraq are braced for any backlash following the execution, defence department officials said. The BBC's Peter Greste in Baghdad says all the legal hurdles are now understood to have been cleared and that if anything is likely to hold up the execution, it will be administrative details. The former Iraqi leader has been in US military custody at Camp Cropper in Baghdad, but some reports say he has now left the camp. 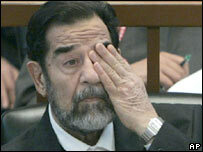 His lawyers said they had been asked to collect Saddam Hussein's personal effects on Friday. Mr Maliki said there would be no delay in carrying out the death sentence. "No-one can oppose the decision to execute the criminal Saddam," he was quoted by AFP news agency as saying. "Those who reject the execution of Saddam are undermining the dignity of Iraq's martyrs." Saddam Hussein was sentenced to death by an Iraqi court on 5 November after a year-long trial over the killings of 148 Shias from the village of Dujail in the 1980s. A trial in a second case, alleging genocide against Kurds, continues against him. The former Iraqi leader was captured by US troops on 13 December 2003, after a tip-off. He was found hiding in a tiny cellar at a farmhouse near his hometown of Tikrit.